Several of Vintage Cellars’ products are ETL-certified (see our Education Center article about ETL for more information about the certification), but three of the new Monterey WineKeeper products are our first WineKeeper Wine Preservers & Dispensers to be tested and approved by Intertek‘s Electrical Testing Labs! 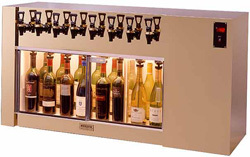 Feel confident that our Monterey 4-Bottle ETL WineKeeper, Monterey 8-Bottle ETL WineKeeper, and Monterey 12-Bottle ETL WineKeeper offer the safest way to preserve and dispense wine in your restaurant or bar. These products can cool several bottles of wine at once and they make dispensing both reds and whites a snap, especially during parties or wine tasting events. Monterey ETL WineKeepers keep your wine tasting fresh for weeks, so you never have to worry when you’re too tired for more than a single glass of wine before bed, and they reduce the risk of you filling up your fridge with half-consumed bottles. So, consider an ETL-Certified Monterey WineKeeper. You’ll know that Intertek independently tested it for safety, and you’ll be pleasantly surprised by how perfect each and every glass of wine will taste and feel.